Purchase both HastaPadas for $60! Receive one in a Lasso (original) Loop and the other in a Overall(Large Loop) plus a FREE Bandha Bag while supplies last. Each Loop will exponentially expand and illuminate your yoga poses with efficiency and support - for your convenience and opportunity to advance your yoga practice safely and securely. Check out the tutorials to see how you can use your own HastaPada® Yoga Strap. The HastaPada® Yoga Strap and Mat Carrier offers an innovative 3-Loop System (one adjustable loop and two stationary loops) that fits either a hand (hasta) or foot (pada) promoting agile and efficient maneuverability to deepen many poses and provides an opportunity to develop good patterning while gradually improving. The multi-functional HastaPada yoga belt supports you and your practice with increased steadiness, security and ease. You may also use it to carry your mat to and from practice. The Adjustable Loop functions like a Lasso Style Loop with the brass buckle on one side of the two stationary loops. The Mandala Loop is where the buckle is placed to use the entire strap in a large circular fashion -the buckle can slide and glide from the other side of the stationary loops or the entire belt length. Adjust the desired length of the loop according to your needs: Just slide the brass buckle to lengthen or shorten the distance required for each pose. The Two Stationary Loops are readily available for quick and easy hand or foot placement. These pre-made loops reduce clenching and can even be easily held with only 2-fingers at times. Our unique design helps you achieve optimal alignment with greater awareness. 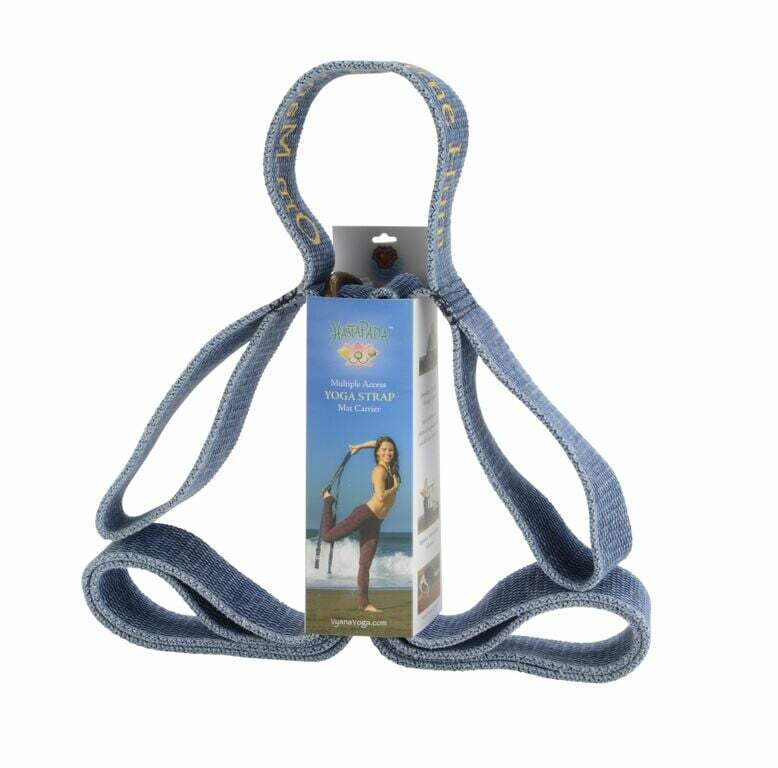 The HastaPada yoga belt is a valuable therapeutic tool that supports all styles of yoga efficiently and easily. Increase your mobility, resilience and strength with continued use to assist in stretching the belly of the muscle instead of the joint. This allows you to create a practice that is intelligent and sustainable. The strap promotes an intuitive awareness of the physical pose which is the embodiment of a yoga pose. It is a handy tool for teachers to easily support their own practice, and an informative prop to encourage students’ progression safely. It’s soft and extremely durable. 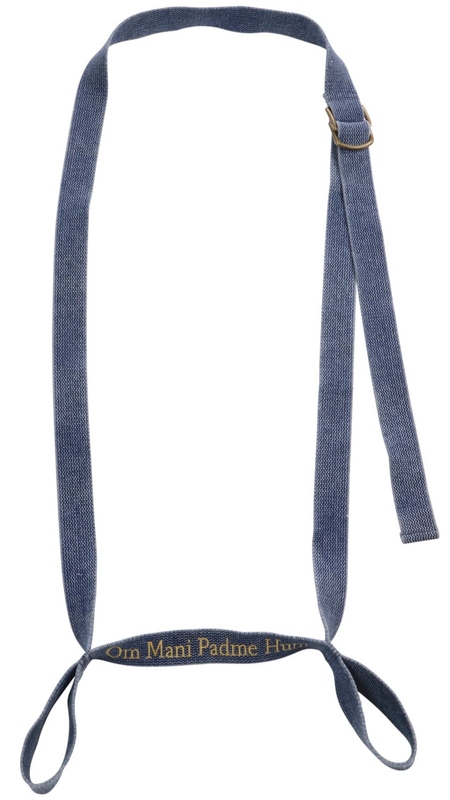 Made of high-quality washed denim weave, this belt feels just like your favorite pair of jeans. Each yoga strap is embroidered with the mantra OM Mani Padme Hum (May the Jewel of Consciousness Be Joined with the Hearts Lotus) to usher in loving kindness and fluid mindfulness within each breath. The HastaPada® is the same strap whether in Lasso/Side Loop or Mandala/Large Loop. For your convenience: The buckle has been pre-adjusted in the Overall Loop/Mandala or Side-Loop/Lasso version for ease and efficiency so you don't have to move the buckle to change the loop over the 2 stationary loops during a practice. Although it is quite nice to have them in their "ready-to-go" loops, it is not necessary to purchase both unless you choose to. Download the Therapeutic/Arthritis brochure! Download the HastaPada pamhplet!